Moccas Court is roughly midway between Hereford and Hay-on-Wye, on the southern bank of the River Wye. Despite its unspoiled location deep in rural Herefordshire, Moccas is surprisingly easy to access. See below for directions from your part of the country or getting here by Rail and Air. Get to Hereford and leave the city via the A438 towards Brecon. After around ten miles you pass Staunton on Wye; shortly afterwards there's a left turn signed for Hay on Wye. This road will take you across the stone bridge at Bredwardine. Follow the road up to the junction at the Red Lion Hotel, then turn left towards Moccas. At Moccas (approx. two miles), turn left at the stone war memorial and left again over the cattle grid after 300m. You will see the sign for Moccas Court by the gatehouse. Take the Westway, and follow the A40 then the M40 until the Oxford turnoff. Rejoin the A40 and follow it past Oxford and Burford for about 45 miles until you reach a left turn on to the A436 to Gloucester and Ross on Wye. Follow the A436 and then the A417 around the Gloucester by-pass and eventually rejoin the A40. Cross the Severn on the A40. Then turn right on to the B4215 then the B4221 for around 10 miles past Newent. At the slip road for the M50, turn left on to the motorway (towards South Wales and Ross). Follow the M50 until the motorway ends and continue on the A40 as it passes Ross. At a roundabout on the A40 on the outskirts of Ross, turn right on to the A49 towards Hereford. Follow the A49 into Hereford (approx. 15 miles). 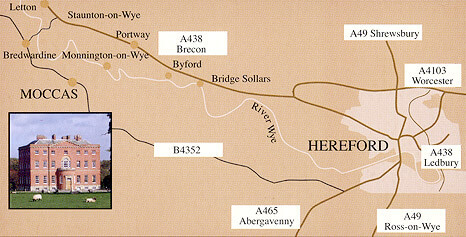 At a roundabout just before the main Wye bridge in Hereford, take the first exit on to the A465 towards Abergavenney. Take the A465 out of town for about two miles, then turn right on to the B4352 (signed to Madley and Clehonger). Follow this road through those villages and towards Hay on Wye for approximately nine miles until you reach the hamlet of Moccas. At Moccas, look for the brown 'Moccas Court' signs. Turn right at the stone war memorial. After 300m you will see a sign for Moccas Court by the gatehouse on the left. Take the M4 until junction 15, signed for Swindon and the A419. Take this exit towards Gloucester. Follow the road for around 30 miles as it crosses the M5 and skirts Gloucester; follow the signs for Ross on Wye until you join the A40 near Gloucester. Hereford station (approximately 10 miles from Moccas) has frequent services from South Wales, the Midlands, the North and London (via Worcester, Oxford and Reading: or Swindon, Bristol and Newport). We can arrange for you to be collected from the station if you require. The nearest airports are Bristol, Cardiff and Birmingham - all of which have good connections both inside Britain and with mainland Europe. Birmingham is probably the most convenient, since the airport is next to Birmingham International station with reasonably good rail connections to Hereford.